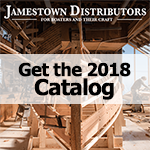 Jamestown Distributors offers a full range of nautically styled precision time keepers and functional weather instruments. Chronometers, barometers, thermometers, hygrometers and complete weather stations all constructed in classic polished brass or modern stainless steel. Choosing the perfect gift for the boating enthusiast is now fun and easy.